Thin-section under crossed-nicols (5 mm in diameter). Note coarse-grained titanaugite phenocryst. SP131 (Walsenburg Dike). Minette. This rock is holocrystalline, porphyritic-aphanitic with fine-grained subhedral phenocrysts in a grey-green groundmass (8%) composed of fine-grained mica. 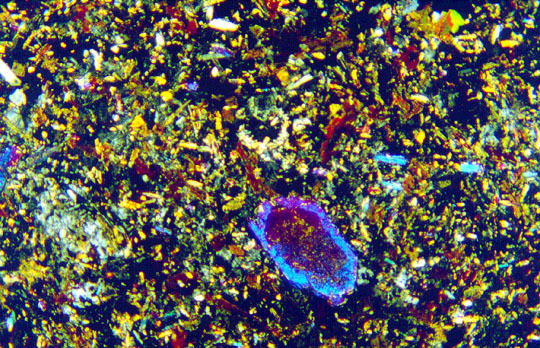 Scattered throughout the groundmass are amygdules (<1 mm) rimmed with orthopyroxene and filled with analcite, potassium feldspar, and glass. All phases are subhedral except for opaque minerals (.1-.5 mm), which are subhedral to anhedral, and fluorite (<.5 m), which is anhedral. The following are present as phenocryst phases: zoned titanaugite (< 1 mm) some with hourglass zonation; orthopyroxene (< 1mm); biotite (.5 to 1.5 mm); orthoclase (< 1 mm); apatite (.1.3 mm). Some of the titanaugite crystals exhibit a sieve-like texture. Relict olivine (.3-.5 mm) is replaced by iddingsite. Biotite was the phase dated.